All photos©FOX2010-13. Not for sale or duplication. Set stills by Chris Tomko. Now shooting its 9h season, the darkly amusing procedural BONES continues to fascinate viewers with atypical murders solved in an atypical manner. World renowned forensic anthropologist & author Dr. Temperance Brennan and her team of scientists at the Jeffersonian Institute help FBI Special Agent Seeley Booth solve difficult crime cases— literally the bare bones of crime investigation! It’s a tortured but solid partnership between Brennan, the brilliant logical empiricist and Booth, the intuitive humanist. The permanent sets are centered in both worlds. The state of the art Medico-Legal Lab, with its ultra-modern girdered levels, catwalks and mezzanine, is housed within the staid museum complex of the Jeffersonian Institute. Segments of the more conventional FBI headquarters are revealed, from offices to padded interrogation room. These give anchor to multiple swing sets through each episode as the case unfolds. In recognition of the 100th episode, just before Season 6,Wannop spoke with SETDECOR about collaborating on the series with Production Designers Phil Toolin [2005-2007] and Michael Mayer[2007-2012], and their crews. 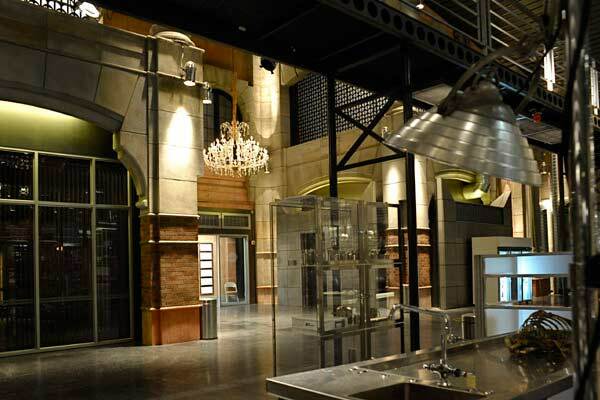 SET DECOR: Tell us about the nexus of the show, the ultra-tech Medico-Legal Lab set within the traditional Jeffersonian Institute. 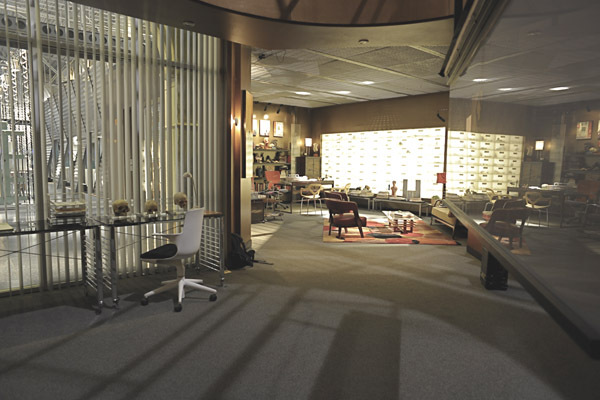 Set Decorator Kim Wannop SDSA: The overall look established for the Jeffersonian's lab was a colorless, sterile, working lab. When I took over the show from Set Decorator Beau Peterson at the start of the second season, Production Designer Phil Toolin and I discussed additions to be made, including bringing in contrast elements. The Lab is a high-tech environment set within the Jeffersonian Institute’s historic Washington DC complex. Phil designed the surrounding walls as the traditional brick building, with a modern lab plopped in the middle. I brought in a huge crystal chandelier that hangs in the main entry to accent a traditional look, but then on the opposite side of the lab, our upper lounge has modern geometric pendants. The high platform lounge gave us an opportunity to throw color into the set without it being overwhelming. Citrus greens and oranges highlight the chrome sterile lab below. We didn’t want the lounge to seem too homey—they are still dissecting dead bodies below—so there are no soft fabrics, and I used molded plastic chairs, glass tables and chrome lamps. There are some pale bricks on the walls, but, other than that, the lab remains a steel lovers dream. SD: How does each character’s office define him or her? KW: Brennan’s international anthropologic travels are highlighted throughout her office. Skulls appear on her desk. Backlit bookshelves show artifacts and silhouettes of statues that she has collected. She also has a mummy standing across the room…and a built-in iguana cage! Brennan is all about her job, she is consumed by it. There are no family photographs or personal items. It’s a reflection of her being able to attack situations clinically and without emotion. 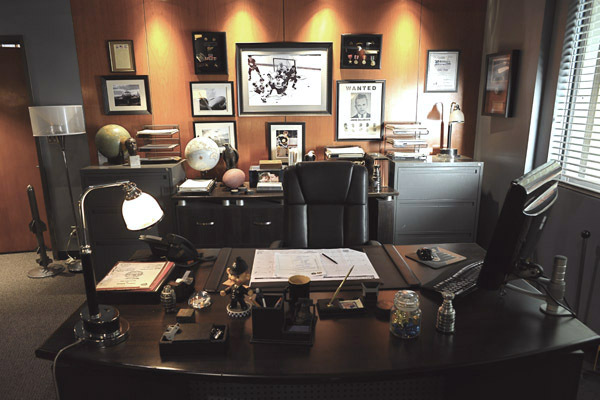 KW: Booth’s office is a little peek into his world. He’s an FBI agent, but wants to fight the establishment. His personal effects are throughout the room, including several sports pieces: putting green, football, a Philadelphia Flyers hockey puck as his paperweight, even a mini Stanley cup. The large picture behind his desk has changed through the seasons but is always a hockey photograph. Booth has a young son, so there are also many photos with him. Booth’s furnishings are manly and simple, he‘s the old beat-up office chair guy. KW: Angela’s office is artsy amidst the coldness of the lab. There’s plenty of color surrounding her. She has a painting area, which gives me the opportunity to incorporate lots of bright hues. The challenge in her office is the Angela-tron – a pull-down screen reveals her 3-d facial reconstructions, which she renders holographically through her patented computer program. When in use, the room needs to be dark for the screen to be seen, every fixture has to dim and the room needs to fade away. I used black-tinted glasswork tables and white Knoll chairs, which become a beautiful grey silhouette. KW: Dr. Saroyan’s autopsy room is actually my favorite set in the lab. Although it is again a stainless world of equipment, I was able to pop more color with her red desk chair, colored specimen bottles and the bright yellow dock lamp that is used for her examining table. The room is also designed with backlit body boxes, which are cool yet creepy. KW: Hodgin’s realm, referred to as the Ookey, is decorated as a bug lovers dream. There are a ton of framed bugs on every wall. Insects, rodents, bats, etc. in jars—not to mention about 20 terrariums with bugs, snakes and flies in them. This room is all about the ingenious experiments that the squints (Booth’s nickname for the scientists) perform, under Hodgin’s jurisdiction and with his great delight. We’ve had explosions, fires and even exploding watermelons in there. KW: The young psychologist’s office is more of a working lounge. He’s almost able to trick the characters into thinking that they aren’t in a shrink’s office. It’s in grey tones with subtle furniture—no fainting couches, just a modern chair for him and a muted charcoal loveseat for his guests. Throughout our FBI, we had a running theme of black and white photography that showed significant moments in the FBI’s and DC’s history. Sweet’s office has three photos of historical monuments being built—the White House, Lincoln Memorial and the US Capitol, symbolizing the building of something stable and lasting, like the trust of psychologist and patient. SD: The two institutions, the Jeffersonian and the FBI, have glass-walled offices, which give opportunities for depth of field – looking out into public areas or across into other offices. Tell us about this design aspect and decorating for it. KW: It’s most effective in Angela’s office in the lab. She has a particular artsy style but it still has to work with the rest of the lab. It also gives me a reason to have detail elements in the background, because there is action going on beyond the foreground scene. Freezers, microscopes, any medical equipment that can serve as background action, are always a plus. In our current season, Booth is assigned to a new FBI task unit, so Production Designer Michael Mayer has re-designed our FBI set. The bullpen is more alive and open, the space fluent and workable for the actors and the camera. 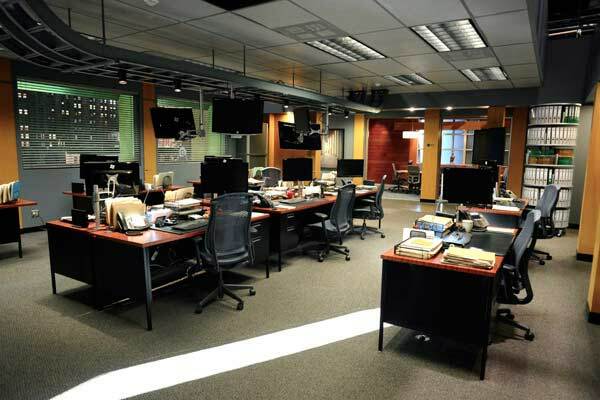 With the addition of more work areas, a total of 17 monitors and more circulation through the room, the FBI is now pulsing with activity. I was able to bring in some functional elements like huge circular binder towers, new desks and chairs. We also broke away from our B&W photography, now there are vibrant color photos of Washington DC monuments. SD: The Jeffersonian has The Bone Room, plus walls of remains and halls of remains…innumerable bones & translucent drawers! Please tell us about the “bones” aspect. KW: Bones are a big character in the show. Obviously it’s the main character’s nickname, but they are what tell the story of the cases. The Bone Room has 304 bone boxes, which has an average of 8 bones in each so…..we got a lotta bones! Not to mention 72 more bones boxes in Angela’s office. The human body has 206 bones, so when you start adding up all the skeletons…! Our dead bodies and skeletons are made by Chris Yagher and his company. They do an amazing job—it can get pretty gross with all the popping eyeballs and burned flesh. From bones to high tech. Tell us about the state of the art lab equipment. KW: They write it, we get it. It’s amazing how much you learn about equipment, medical lingo and procedure when working on a forensic show. The props department, headed up by Ian Scheibel, gets to bring in most of the cool lab instruments. We deal in the bigger equipment, including the recurring Bone Bath, which is a huge chrome cylinder that the skeletons or limbs are dipped into to remove the flesh. The actors also use an array of microscopes and the Mideo Macro-cam, which is a live-feed microscope view onto one of our monitors. It gives the audience a chance to really see what the action is. 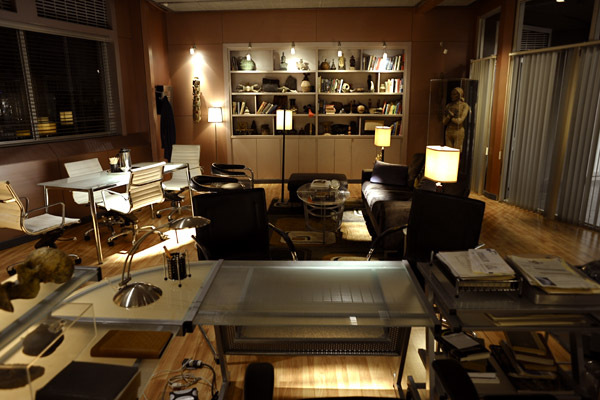 SD: Are the wide shots of the Medico-Legal Lab all set dressing or partially cg’d? KW: It’s all there. 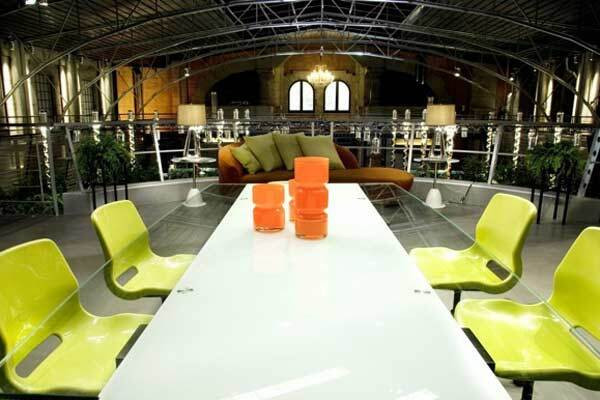 The 3 steel tables and 2 practical light tables on the platform were made for the set. The 3 steel tables in the autopsy room were also designed for the set. Our 2 autopsy tables are actual morgue tables that were once really used …yep, gross. And the steel gurneys are everywhere. SD: There are recurring sets that are not forensic! Please tell us about The Founding Fathers bar. KW: This is where our gang goes to drink! After a long day around dead bodies, I’d want a drink, too. I joke that I decorated this bar in a “Modern Colonial” style, which I don’t think exists. 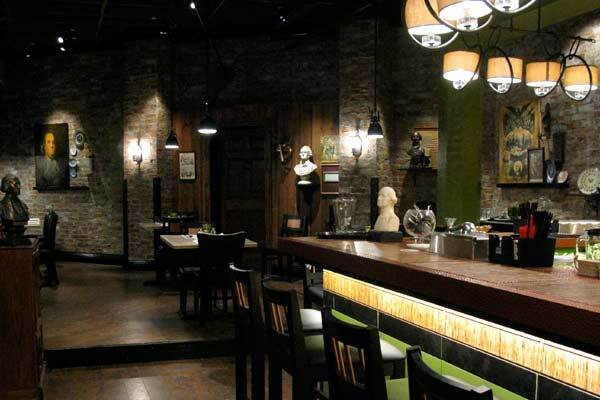 The look of the bar has a modern feel with iconic historical images, like an oil painting of Ben Franklin with a Restoration Hardware pendant light above it, or a Liberty Bell ice bucket on an up-lit glass back-bar shelf. There are Revolutionary War cartoons, busts of our founding fathers and placemats that declare “Join or Die”. Michael Mayer designed a wonderful U-shaped bar that gives the opportunity to shoot around the whole room. A vintage-green wall with black trim, exposed brick walls and toile drapery lend to the feeling of sitting down in DC for a quick drink after work. KW: Yes, the Royal is that East coast dirty spoon diner. Phil Toolin and I really wanted that East coast feel. There is an entire wall of overlapping B&W framed photos of old diner scenes. From the chrome barstools, old tin signs on the wall and the large overhead menu board, it’s all about walking into something comfortable, something familiar. SD: And there’s no place like home…at least not quite like these! 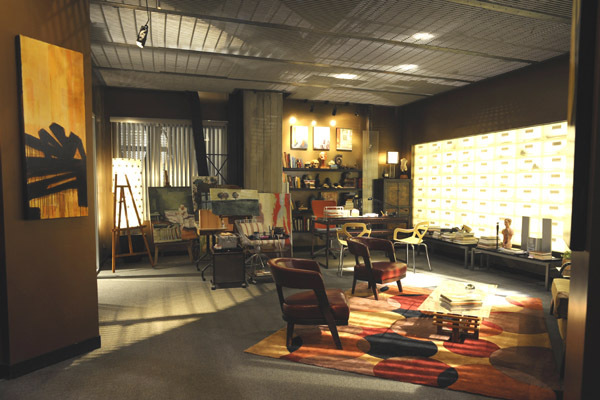 What can you tell us about Brennan’s loft and Booth’s apartment? KW: Brennan brings her work home with her, so there are sculptures and artifacts from around the world. She has a 9’ concrete slab table in the middle of her living room for when she needs to work at home. Although there are these elements around, she still has a feminine side. It’s very subtle, but the color scheme of neutrals and modest colors convey that she’s not as hard as she seems. Michael Mayer designed beautiful blonde wood bookcases that house her array of worldly trinkets. 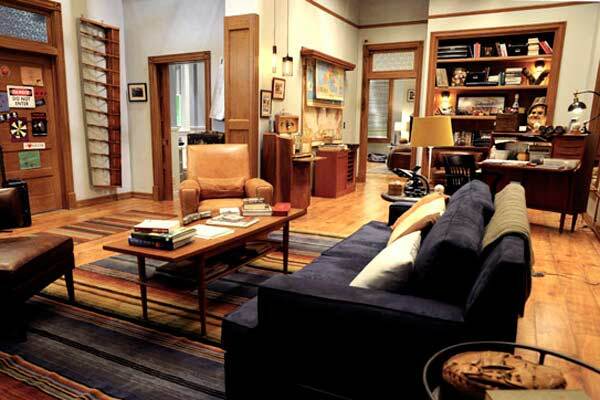 Booth’s apartment is definitely my favorite set. It’s very character-driven. The original concept for the apartment was that it was a renovation in progress. This meant always having ladders and toolboxes around. Michael brought in a beautiful distressed fireplace mantel and designed an open stud look in some of the walls. The signature furnishings are Booth’s deep blue couch and vintage leather recliner. Vintage elements are throughout the apartment—old cameras, a record player, a 50’s cabinet bar, and even an old boxing ring bell. Booth is into old things, the appreciation of when things were simple and had style. SD: The range of swing sets is impressive – from a Senator’s home to a huge rats’ nest in a subway tunnel! How many swing sets per episode? KW: We average about 6 swing sets per episode. I am truly fortunate to work on a show with such range. For example, our opening episode in the upcoming Season Six has an Afghan village, a Paris rooftop, a Muluku jungle, a TV studio, sweatshop, modest apartment, and county morgue. I love it! I love the diversity and the challenge. I’m sure one of the biggest compliments for a decorator is someone believing that your four walls were a real location, “Oh I thought you shot that in a real morgue!” I am truly flattered when I get that response. 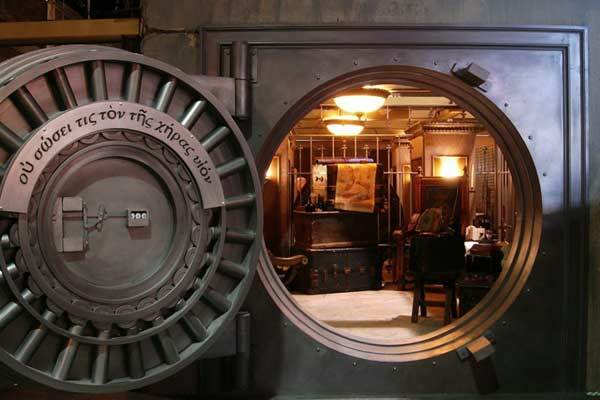 SD: One of the most remarkable sets was for this last season’s finale, the Hoarder’s Apartment. Please tell us about the process involved in creating this literally many-layered set. KW: The Hoarder’s set was an amazing experience. Unknowingly, my buyer Ethan Goodwin and I had been doing research for months by watching the reality series HOARDERS. We were so happy to get this script. There were many meetings about the look and how it was going to be constructed. The character wasn’t a trash hoarder but a collector hoarder, which meant 6 to 10 of everything. I was able to get literally one ton of newspaper from the LA TIMES, and my poor crew had to hand bundle most of it to look like the hoarder had separated it into controlled madness. Underneath all of the clutter and paper, there was a living space. I dressed the room with the core pieces…desk…living room furniture...kitchen, and then started to build on them until you almost don’t know what you are looking at, and then you see, “Wow, there’s a couch under there.” The clutter was a character. Producer/Director Ian Toynton was very involved in how the cast, camera and crew could move thru the space. Most of our piles were on wheels for easier camera shots, but it was very limiting for the look not to be disturbed. SD: Re: the Hoarder’s apartment, Dr Brennan observed, “This is an anthropological microcosm of this man’s life.” That could well describe many character’s sets. Would you like to comment? KW: Being able to make a character come across with no words spoken…it’s not an easy job, especially by the time the scene is edited down to the final cut. When I first started in the art department, my goal was to be a production designer. I was fortunate to work on the show PHILLY for its last episodes as the art department coordinator with Paul Eads as the designer. I am a huge fan of his work. I would go down to the sets, see them being built, see the set design, the molding being put in, the color choices, and the aging that went into the sets. I learned so much in that short time. But on one set, I saw it before it was dressed—a beautiful empty room. 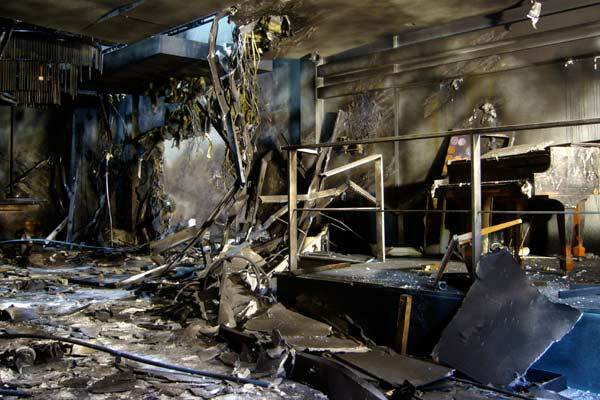 When I came back the next day, Mary Ann Biddle [Set Decorator Mary Ann Biddle SDSA] and her team had transformed it. Although the bones of the room were there, she gave the room its character, its life. Every piece of dressing described what was going to happen and who that character was. And I thought to myself, “Well, this is it, this is what I want to do.” It was truly inspiring.